Grace Bay Beach, Turks and Caicos. The pristine Pine Cay and Water Cay coastline. 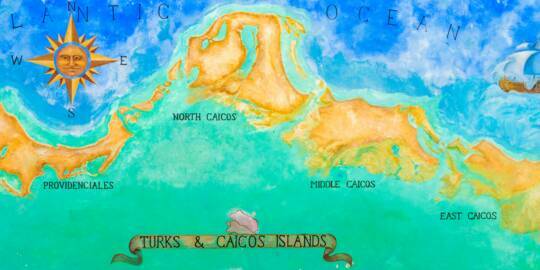 The Turks and Caicos Islands is a small tropical archipelago nation found south of the Bahamas. We’re home to spectacular beaches, a pristine marine environment, luxury resorts and fine dining. There's so much to do and discover here in paradise. Incredible beaches, crystal clear and warm ocean water, abundant marine life and beautiful tropical wetlands are yours to explore. Quite simply, we're the best vacation destination of the Caribbean. The tranquil Sapodilla Bay Beach on Providenciales. There are eight main islands in the country, with six of them inhabited, and countless small cays. With an area of 238 mi² (616 km²), the TCI is about double the size of the Florida Keys. Providenciales, also known locally as Provo, is home to the spectacular Grace Bay Beach, most luxury and all-inclusive hotels and resorts, and is the destination for the majority of overnight tourists. It's also where the majority of our population of 31,458 reside. All international flights arrive here. All cruise ships arrive at the island of Grand Turk, which is also home to the country’s capital of Cockburn Town. North Caicos and Middle Caicos, South Caicos and Salt Cay are laid-back and a bit more down to earth, and are largely supported by low-key tourism and small-scale fishing and farming. 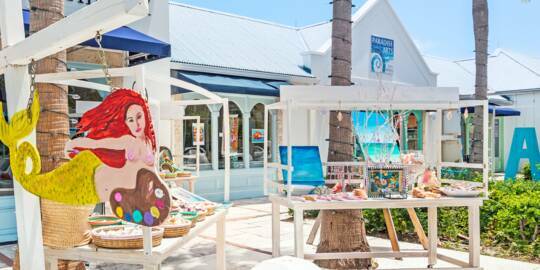 The Turks and Caicos has experienced a fascinating and varied history, with fortuitous connections to several memorable events that took place in the Caribbean and New World. The Turks and Caicos (TCI) is found halfway between the Bahamas and the Dominican Republic, and by air is only a 90 minute trip from Miami and 3 hours and 40 minutes from New York. The island of Grand Turk is home to the only cruise ship port in the country and welcomes several vessels per week. Domestic flights and passenger ferries connect the inhabited islands in the Turks and Caicos. If you'll be renting a car, print a map of your island to help plan and find your way around. Other Caribbean destinations offer giant water parks, nightlife or the extravagant Carnival. Our tourism claim to fame is a bit closer to nature – we have the best beaches in the world. This is of course a tremendous assertion to make, but take a few steps on our powdery sand and we’re sure that you’re agree too. Pristine white sand (often slightly tinted with pink) and crystal ocean water with breath-taking turquoise and blue hues define our coasts. And we don’t just have one or two great beaches, every main island in the country hides wonderful and secluded beaches, some of which go months without seeing a single visitor. There are miles of pristine sand and sea to explore. 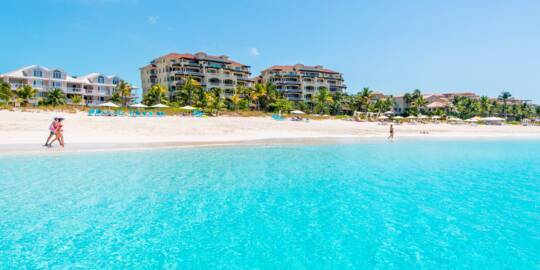 The crown jewel of the country, the unrivalled and world-famous Grace Bay Beach on Providenciales, has captured countless awards and recognition. Never crowded, Grace Bay is true paradise. Sailing off the Caicos cays. What good is a top-rated beach without sunny weather and a perfect climate? 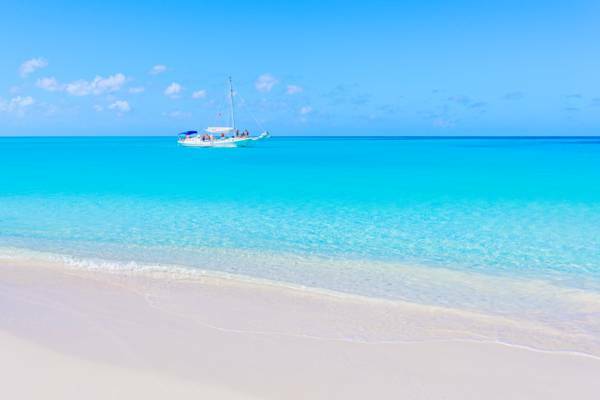 The Turks and Caicos boasts an average of 350 days of sunshine per year. Temperatures are consistently warm and there’s very little rain to dampen the mood. Providenciales, the main tourism island, garnered TripAdvisor's Traveler's Choice award as Best Island in 2015, and Grace Bay Beach currently holds the top spot in the Best Beach category. Throughout the year, our ocean water temperature is also good news for your vacation, maintaining a pleasantly warm and serene average in the mid-80°F range (29°C). Paddling in the mangrove channels of the Princess Alexandra Nature Reserve, Providenciales. There’s always something fun to do on or in the ocean while on your holiday. An expansive barrier reef, the third largest in the world, protects the coasts and is a home to vibrant coral, dolphins, turtles, stingrays and colourful fish. Little shore reefs and the sheer wall sites (where the coral shelf drops abruptly from 50 feet into the thousands) create the perfect diving and snorkelling playground. The sheltered and winding mangrove channels of the Turks and Caicos wetlands are prime spots for stand up paddle boarding and kayaking. You’ll see conch, turtles, stingrays, baby sharks and bird life the way they are meant to be seen; in their natural environment. Want to get your heart racing? Take in the view from above with parasailing over Grace Bay, go horseback riding on the beach, or cruise the unbelievably-turquoise Caicos Banks on a jet ski. Wakeboarding and tubing are also great, with incredible flat water spots hidden between our pristine cays and beaches. On the breezier days, the kiteboarding and wind surfing conditions are excellent. The shallow turquoise water and clean sandy bottom of Long Bay Beach on Providenciales is increasingly becoming recognized for what it is: one of the finest kite spots in the region. Exciting activities and attractions are found on land as well. Caves, historical ruins and nature await. For those with relaxation in mind, one of our luxurious spas is the perfect place to get away from it all. Seven Stars, Le Vele, and Point Grace Resorts on the pristine Grace Bay Beach, Providenciales. The choice of luxury hotels, all-inclusive resorts and vacation rental villas is extensive. The island of Providenciales hosts all of the expansive resorts in the Turk and Caicos. Choose from beachfront suites on the award-winning Grace Bay, comfortable luxury villas overlooking the brilliant waters of Chalk Sound Lagoon, Turtle Tail and Long Bay, or the exclusive resorts of the rugged and wild west coast. Providenciales is home to several all-inclusive resorts, including family oriented Beaches Turks and Caicos (part of the Sandals group) and Club Med. Although they lack large-scale luxury hotels and resorts, the smaller islands in the Turks and Caicos offer tranquil accommodations in their own right. Small and romantic vacation rentals, often primely located on secluded beaches, take the place of extensive resorts. Many of our resorts boast an impressive range of amenities and service, including boutique spas and exquisite in-house dining. Concierge services at your hotel are able to arrange everything from private boat cruises to a morning round of golf. Vacation rental villas can be a great choice for larger groups. There’s a wide selection of lodgings in the villa category, including everything from a single room to an expansive beachfront mansion, with bookings available for single nights or by the week. Amenities may include a pool, complimentary use of a car, free airport pick up, visits to the spa, gourmet chief services, and water sports equipment. Whether you’re looking for an extravagant all-inclusive resort or a quiet and secluded lodging, the perfect accommodation for your holiday is waiting. The Turks and Caicos is fortunate to be home to an incredibly beautiful reef system. A vibrant barrier reef surrounds both the Turks Islands and Caicos Islands archipelagos, and many of the region’s top scuba diving sites are found here. Providenciales and Grand Turk offer a wide range of professional dive shops, which regularly visit hundreds of dive sites across the country. For those who’d rather stay a little closer to the ocean surface, a snorkelling boat tour is a great way to experience our underwater environment. Excursions stop at many locations accross our barrier reefs, shallow bays and uninhabited coastlines. There’s always fascinating marine animals to spot. In addition to colourful reef fish, turtles, conch and stingrays are common, and you may even see Jojo, our unique and friendly Atlantic bottlenose dolphin! Providenciales offers quite a few reefs close to shore. You’ll be able to see exquisite coral and reef fish right off the beach at Smith's Reef and the Bight Reef. Several reefs are in shallow water and are perfect for children. Beach cruising off of the Caicos Cays. 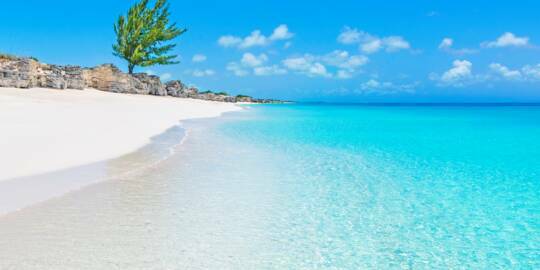 The Turks and Caicos Islands, through its status as a British Overseas Territory, is a stable democracy with English as the official language. On our national flag, you'll see the Union Jack along with our crest. We have a locally elected government, headed by a premier, and an appointed governor. Due to the small size of the country, we don’t issue our own money and instead use the US Dollar as the accepted currency in the islands. Most US, Canadian, UK and European mobile phones will work here, so it’s easy to keep in touch with friends and family back home. Browse our travel guides for hints, tips and local business info. A little research will help you get the most out of your Turks and Caicos vacation experience. The Turks and Caicos has become a popular destination for beach destination weddings and honeymoons, and many of the local resorts offer specialised packages. 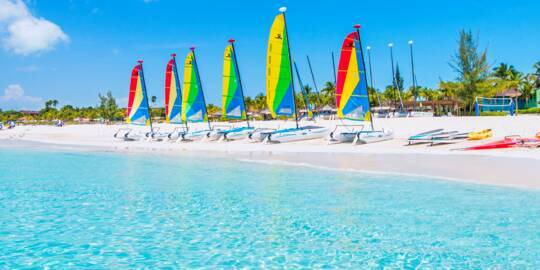 The Turks and Caicos is also a tropical getaway of choice for the rich and famous. Countless celebrities have taken vacations to our secluded islands. Here you can find tranquillity and amazing beaches – far from the bustle of life in the city. The easiest way to get around our islands is by rental car. 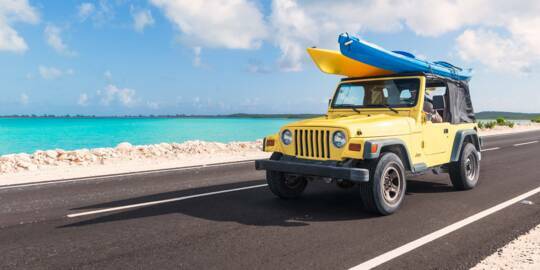 Providenciales is the busiest and main tourism island in the country, and there’s a huge selection of cars and companies to choose from, and possible rental vehicles include everything from upfitted Jeep Wranglers to fun Mini Moke beach cruisers. Porter's Island Thyme, Salt Cay. Offering a diversity of cuisines and local food, Providenciales has become an exceptional destination for gourmet dining. Freshly-caught conch, lobster and fish factor into many dishes, however, international twists and fusions are what makes the country’s restaurants so delicious. Many of our popular establishments offer a menu combining the top tastes from our islands, Jamaica, the Bahamas, America and Europe. If you’d prefer something a bit more authentic, pan-poached grouper and lobster, cracked conch and fish stews have been favourite local foods for generations. If you’re looking for the full cultural experience, try one of our local restaurants featuring live music. For those staying on an all-inclusive holiday, the dining choices are varied as well. 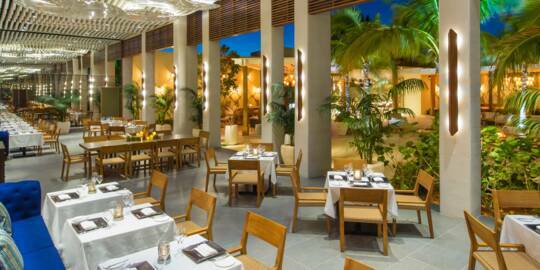 Each of our all-inclusive resorts are home to a wide array of restaurants and cuisines. Several of our world-class restaurants are quite popular, so you may want to make your reservations in advance! The island of Providenciales is the home of gourmet dining in the Turks and Caicos, and there’s a wealth of amazing restaurants to sample! Visiting the uninhabited Fort George Cay. Taking a day trip to one of our smaller and less-inhabited cays is a recommended activity. The Turks and Caicos is home to so many beautiful vistas, and planning your own tour is easy. When in season, humpback whale watching can be a truly incredible experience as you swim with these gentle giants. An island hopping boat cruise is the perfect family trip. Along with the amazing beaches and ocean, some of our uninhabited cays are home to a unique and friendly animal – the Turks and Caicos Rock Iguana. These large lizards are quite approachable and offer an all-too-rare chance to see a critically endangered animal in its natural environment. Boat cruises often include a little of everything: snorkelling, sight-seeing, tube wake riding and a beach barbecue. There's a countless array of spectacular places to explore in our island chain. Check out our destination guides for everything you need to know about booking your excursion. An expansive villa in the Turks and Caicos. The Turks and Caicos is becoming a hotspot for luxury real estate and development. There are many exquisite coastal regions in the country, from secluded coasts such as Silly Creek, Turtle Tail, and Leeward on Providenciales, to deserted beaches on our less populated islands, including Bambarra Beach on Middle Caicos and Whitby Beach on North Caicos. The private island of Pine Cay and Parrot Cay are also amazing retreats, with a laid-back yet elegant atmosphere. Spectacular beaches line the north coasts of these two exclusive cays. There’s a wide range of architects, contractors, and project managers to help you create your dream home in paradise. An American Airlines Boeing 737 approaching Providenciales over the Chalk Sound National Park. It’s easy to get to the Turks and Caicos. 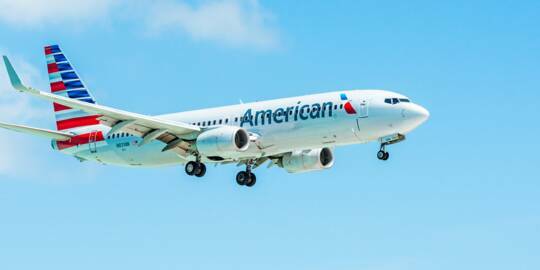 Direct flights from major US airlines connect Providenciales to New York, Miami, Boston, London Toronto and many other cities in the United States. Canada is also within easy reach, with direct flights from Toronto and Montreal. Regional airlines connect the Bahamas, Jamaica, Puerto Rico and other destinations. Convenience is key. Once your plane touches down, you can be relaxing on Grace Bay Beach in less than an hour. You won’t have to spend hours travelling by bus, car or train to get to your accommodation. For those renting a car and driving here, our road system is good and speeds are limited to 40 MPH. We do drive on the left, though! The time zone observed in the Turks and Caicos is Atlantic Standard Time (GMT-4) – essentially New York time with Daylight Saving Time continually observed. Although on a longitude similar to the east coast of the United States, in 2015 the Turks and Caicos switched from Eastern Standard Time so as to give everyone more time in the sun! As a British Overseas Territory, the Turks and Caicos bases its entry requirements and visa policies off of the practices of the United Kingdom. No visa is necessary for those who hold a passport or valid resident or tourist visa from the United States, United Kingdom or Canada. Quite a few hotels and resorts offer vacation packages, which include airline tickets, activities, dining, and, of course, lodging. Such deals often offer significant savings on your vacation costs. A cruise ship off the beautiful beach at Grand Turk. The only cruise ship port in the Turks and Caicos is located on the island of Grand Turk. Here you’ll find great beaches, historical sights from the sea salt industry, and the country’s only lighthouse. Browse our travel guides and budget vacation page for essential information and hints and tips on getting the best prices on accommodations, flights and transportation. It’s possible to book directly with many of the local accommodations and save. Grand Turk was a witness to several historic events in human history. The little island may have been Columbus’ first point of landfall in the New World. France and Britain wrestled for control of our archipelago in the late 1700s and Horatio Nelson suffered one of his few defeats (albeit minor!) here, and John Glenn’s first step back on dry land after orbiting the earth in 1962 was on Grand Turk. One of the best ways that cruise visitors to Grand Turk can spend their stay is to simply explore. The island is very small, safe, and easy to navigate. Arrange your car rental, and you’re off! The Turks and Caicos experiences natural changes in tourist arrivals throughout the year, with the winter months being the “high season” and the quieter autumn months referred to as the “low season”. Local hotels, water sport businesses and spas often offer special discounts during the low season, and rates for rooms may be as much as half off the high season price. Cruises typically depart from east coast American cities such as Miami, Orlando and New York, and then follow a counter-clockwise loop through the upper Caribbean, so the memorable and incredible beaches of Grand Turk will typically be the first or last shore stop of the cruise journey. Exploring the Caicos Cays on a boat cruise.